10.75% Magma Fincorp Limited NCD – Apr'19 – Should you Invest? 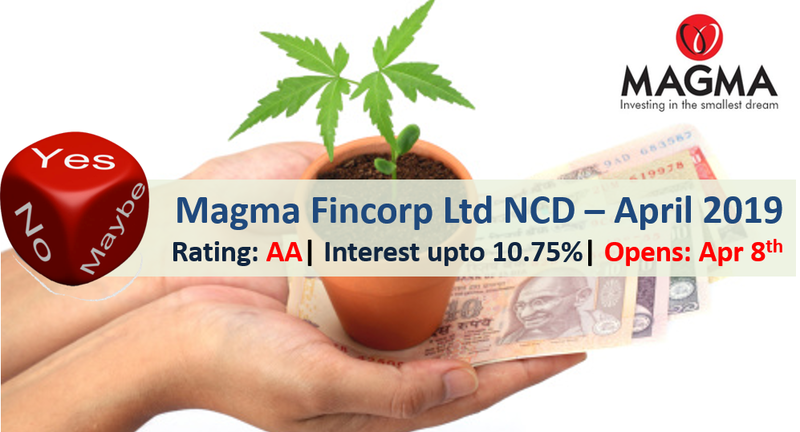 Magma Fincorp Limited is a non-banking finance company, incorporated on December 18, 1978 has come out with public issue of non-convertible debentures (NCD) offering up to 10.75% interest rate. Company is engaged in providing asset backed financing for new and pre-owned auto and utility vehicles, tractors, cars and commercial vehicles, mortgage financing, financing to SMEs and distribution of general insurance products. There are 7 options of investment in Magma Fincorp NCD. Magma Fincorp NCD – Who can Apply?